PUEBLO, Colo. – Two Pendleton Whisky Velocity Tour events for Jose Vitor Leme. Leme is a perfect 4-for-4 this season on the Velocity Tour following his victory this past weekend at the Dayton Rumble, and he has no plans on slowing down at any point this season. The No. 3-ranked rider in the world standings is committed to riding anywhere and everywhere, even when the Unleash The Beast is on break, in hopes of achieving his dream of a World Championship. It is common for international riders to use the summer break as a chance to go home and visit with their families. American riders also sometimes opt to use the summer to spend more time at home and let their bodies heal from any injuries. Leme, though, sees a greater opportunity to stay in the U.S. and compete at various PBR events while the premier series goes on hiatus. It was a lesson Leme learned last year as, other than the Global Cup, he did not compete at PBR-sanctioned events during the summer break. Leme wound up 422.5 points shy of winning the 2018 World Championship. Therefore, he is not wasting any time in picking up additional points in 2019. Leme is the only World Champion contender so far this season to rack up significant world points at non-UTB events. The 22-year-old has earned 415 points toward the world standings with his two Velocity Tour victories, which is the equivalent of winning the event average at a two-day Unleash The Beast event. 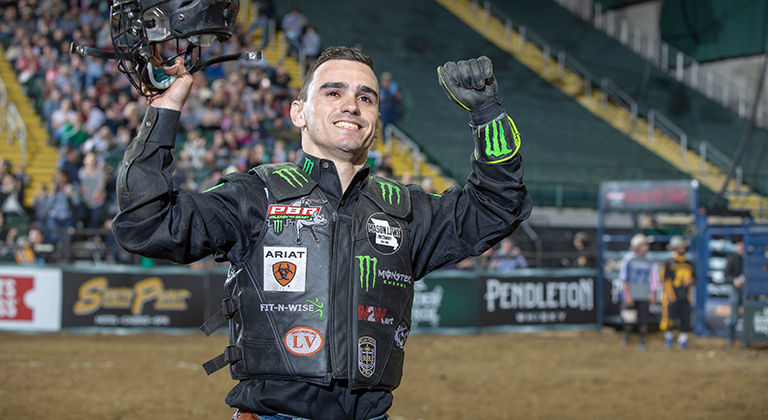 Only four other riders in the Top 10 have earned world points at non-UTB events – Ezekiel Mitchell (240), Jess Lockwood (105), Joao Ricardo Vieira (55) and Chase Outlaw (45). Lockwood, who is set to return to competition from his broken collarbone this coming weekend in Kansas City at the Caterpillar Classic, has already said he too will be making a full push during the summer. Both Lockwood and Leme will be able to rely on their athletic pedigrees and dedicated fitness programs to go on a summer run. Lockwood, a Montana high school state wrestling champion, and Leme, a former semi-pro soccer, train constantly to attempt to handle the rigors of the toughest sport on dirt. The world leader, though, has been out for four events because of that broken collarbone, and Leme has been able to make up significant ground in the World Championship race. Lockwood was up 1,102.5 points on Leme before breaking his collarbone at the 2019 WinStar World Casino & Resort Global Cup USA in February. Leme has since gone 9-for-13 at all levels of competition to shave 986.66 points off Lockwood’s lead. Leme earned 220 world points in Dayton by winning the long round (86.5 points on Thunder Hooves) and taking home the event average and victory by riding Free Wiskey for 86 points. He previously won the Velocity event in Corpus Christi, Texas, on Dec. 1 for 195 points. "I am certainly very happy for these points, they are very important points for me because I am getting closer to number 1," Leme said. Leme was not the only world title contender to strike in Dayton. Vieira earned 55 points in Dayton by also going 2-for-2 with rides aboard Tequila Slinger (84 points) and Louisiana Man (85 points). The No. 2 man in the world standings finished third and is just 47.5 points behind Lockwood. Leme, though, has won back-to-back events with Duluth and Dayton. “To come in at No. 1 before the break would be awesome,” Leme concluded.